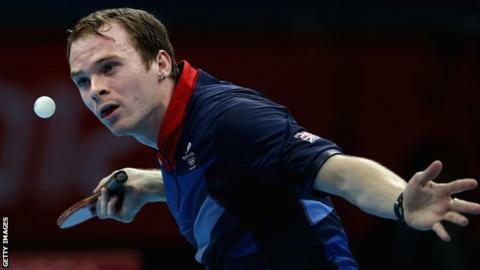 England's men and women made winning starts as they attempt to earn promotion into the top tier at the World Team Table Tennis Championships. England's women edged out Wales 3-2 in their Group F opener in Tokyo, before the men beat Thailand 3-0 in Group G.
England's men, 23rd in the world, have not been in the top flight since 1997. Olympian Paul Drinkhall, who won the Spanish Open earlier this month, said: "Our level is good enough to be in the top tier." His team are the top seeds in a group that also includes next opponents Congo-Brazzaville, Israel, Slovakia and Turkey. The group winners receive byes to the quarter-finals, while the second and third-placed teams must play an extra knockout round for a chance to reach the last eight. Only the two finalists are promoted. Drinkhall, 24, and fellow Olympian Liam Pitchford are joined in a four-man team by Sam Walker and Daniel Reed, the latter replacing Andrew Baggaley, who withdrew following a family bereavement. Drinkhall's victory in Spain - at a secondary Major Series event - came after a year-long hip injury and was the first title won by an Englishman at world level since 1996. Pitchford, 20, climbed more than 70 places in the world rankings after reaching the quarter-finals of the 2013 German Open, one of the sport's top-rated Super Series events. "Winning a title is one of my main goals and to see Paul do it drives me on," Pitchford, now just outside the world's top 50, told BBC Sport. "There's that buzz, when we get together as a team, that we can do something now. We've got the players to be able to win." Drinkhall said: "Over the last year or two, the amount that everyone is improving has been great. The strength in depth is getting a lot better." England's women - Joanna Drinkhall, Kelly Sibley, Hannah Hicks and Tin-Tin Ho - are also seeking promotion, having been relegated to the second division four years ago. The English quartet will face Colombia next before games against Israel, Lithuania and Malaysia.